The Royal Dublin man shot a 69 edged out Baltray's Gareth Bohill for the honour thanks to his better second round score. Kearney and Bohill (70) finished in five-under par 137 with last year's beaten finalist, Dessie Morgan, three shots back on 140. Defending champion Shane Lowry rallied with a 67 to make the top 64 qualifiers with eight shots to spare as the cut fell at 151. Donal O'Brien, Greg Crew and John McGinn were eliminated on countback. Six hours and 35 minutes after their original 12:51 second round tee-time (pushed back 90 minutes due to a frost delay), David Barry, Michael Sinclair and Kevin Stack putt out on the 18th at Rosses Point at 19:26 on Saturday night. Headfort’s Rory McNamara captured the silver medal award to the leading qualifier but four players must to return to Rosses Point to complete the weather-delayed second qualifying round of the West of Ireland Amateur championship at 7.30am on Sunday. 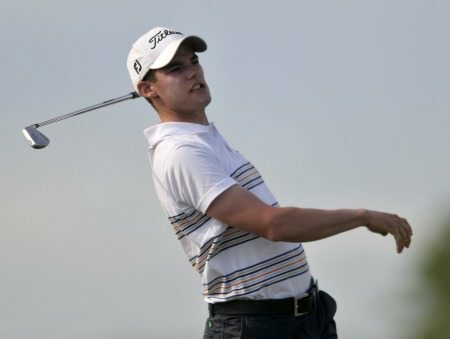 Leading qualifier Brian Casey is in top form in the North of Ireland Amateur Open at Royal Portrush. Picture © Pat CashmanHeadfort’s Brian Casey claimed the silver medal for the leading qualifier on a countback as the matchplay stages of the fog-delayed North of Ireland Amateur Championship got underway this afternoon.